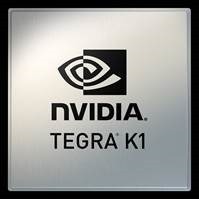 The headlining feature Nvidia is touting in Tegra K1 (previously codenamed Logan) is the 192-core GPU based on the desktop Kepler architecture. By comparison, the current Tegra 4 is limping along with only 72 older GPU cores. 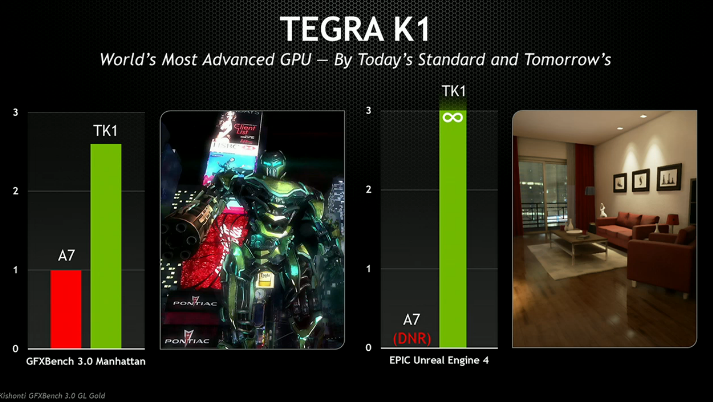 Nvidia had a number of fancy charts to illustrate how superior the Tegra K1 GPU happens to be. 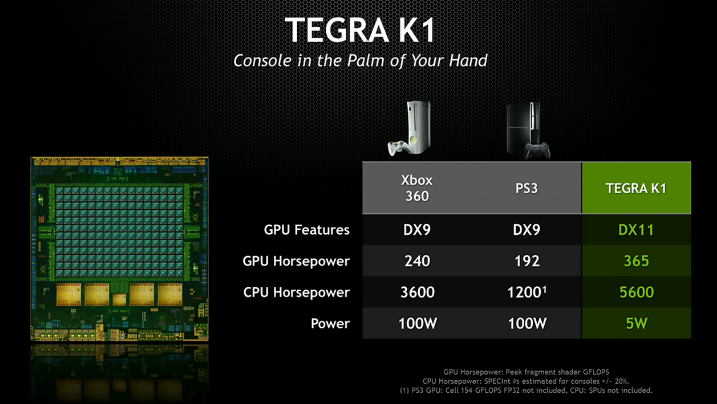 The company says Tegra K1 will support DirectX 11.1, CUDA, and has more raw horsepower than the PS3 or the Xbox 360. 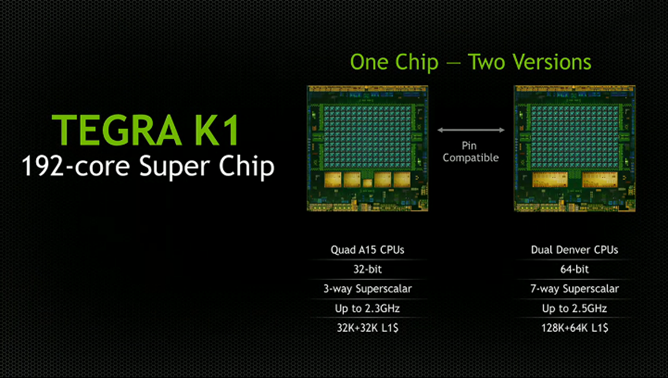 All this and it is expected to be more power efficient than the current Tegra GPU. Perhaps even more notable than the new GPU is a shift in Nvidia's previously reported roadmap. There will be two flavors of Tegra K1 – the first will be a quad-core Cortex-A15 CPU cluster with the Kepler GPU (and a helper core), but there will also be a version with dual-core Denver CPUs. Nvidia's Denver architecture wasn't expected to debut for another generation past Tegra K1. 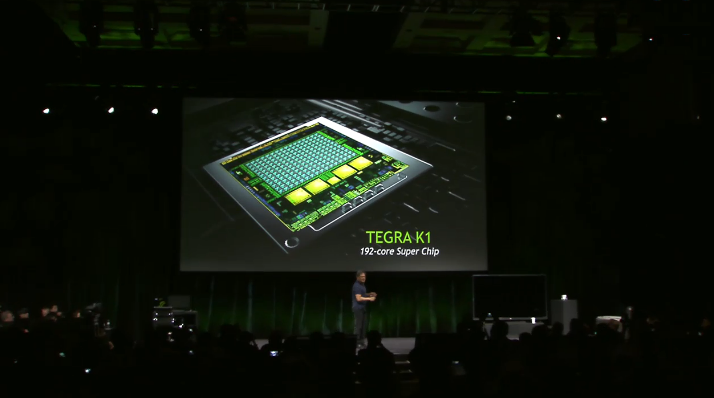 Denver is a custom design for Nvidia's new ARM-compatible CPU cores, so there won't be any more Cortex reference CPUs in Tegra – it's just like Qualcomm and Krait. Denver is based on the next-generation ARMv8 instruction set and supports 64-bit. Nvidia CEO Jen-Hsun Huang didn't specify any exact timeline for each version of the chip, but the A15 edition is expected to be out in the first half of the year. The Denver CPU version will come after that in the second half of 2014.